I bet you weren’t expecting to see a bathroom remodel, since I haven’t mentioned doing one, and quite honestly, I wasn’t expecting it either. We only have 2 bathrooms, and both of them have already been remodeled, so here’s the long-winded explanation, with lots of photos. If you hate long-winded explanations, skip the next several paragraphs and just look at the photos. 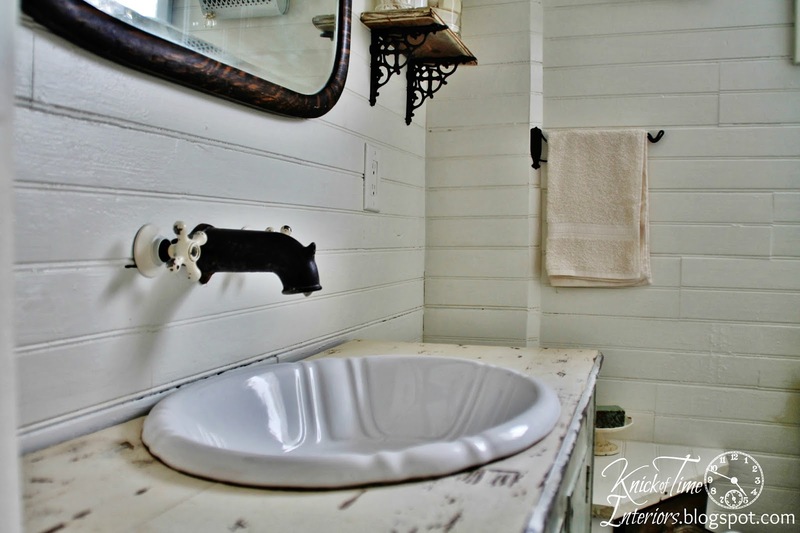 I hope you enjoy our farmhouse bathroom makeover! I was sitting in the bathtub one evening last week, and I realized that the doilies I had hanging clothesline-style above my bathroom mirror needed to be laundered. They’ve been hanging there for two years, so they were due for cleaning. Once I got out of the tub and took them down, I decided that I wouldn’t rehang them – I’d make a sign instead. So, I found an old board that had been a leaf of an antique table, and I created a sign. Once I created the sign and went to hang it, I realized that it didn’t really look good against the chippy, turquoise walls in the bathroom. Honestly, I was never really crazy about the color of the wood we put on the walls, (read that story here), so I contemplated painting them. I mentioned it to my husband, and at first he balked, but he’s pretty easygoing and said I could. I took a poll on Facebook, and the vote was about 50/50, about whether I should paint them. Once I get a “burr under my saddle” though, I rarely change my mind. Off to Lowes I went the next day. I had decided on changing the color to an antique white, so I bought a gallon, returned home, and started painting away. About 3 minutes into it, I realized that the color I bought was too bright white. I returned to Lowes, asked them to deepen the color, returned back home, and started painting again. I thought it looked pretty good, and got 3 of the 4 walls painted by evening. Happy with my work for the day, I rewarded myself with another long soak in the tub, to admire my work. Sitting there in the evening, under artificial light, the walls looked so creamy yellowish, I felt like I was sitting in a big vat of butter. Not only did I not like the color, but I realized that all the gaps between the boards looked terrible. They weren’t noticeable in the original color, but looked like dark lines across the new white paint. The next day, I returned to Lowes again, picked another paint color and some caulk, and came back home to start round 3. Third time’s a charm, right? Thankfully, it was. I loved the new color. The upside to all that is that I decided to try leaving the doors and trim in the creamier color, and paint the walls in the lighter white, and I loved the result. It’s hard to see the variation of the trim color and wall color in the photos, but pairing the two shades together looks so much better than it would in all one color. Now that you know the why and the how…here’s the photos. Mind you, this isn’t really a full remodel – it’s more of a makeover, as I still have the original bathtub that I hate. But…all the decor was taken down and I redecorated the whole room after painting the walls. It’s hard to get a good full-room shot in a small bathroom, but here are a few shots showing the overall look, followed by some close-up shots of the changes. Since the sign was the first change I made, the rest of the decor I used was chosen to compliment it. I didn’t buy anything other than the paint and caulk – just “shopped” from my own home and from my online shop. The store is a fictitious. I wanted something that sounded early 1900’s, so I made up the name, but I Googled it, and there are several businesses with that name! 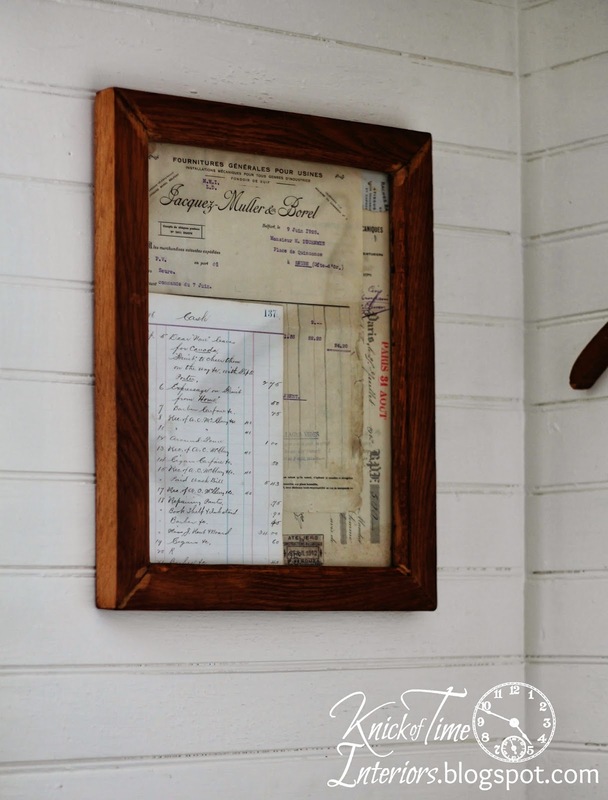 Remember the antique French invoice printables I shared last week (here and here)? This is what I did with several of them. I just layered them together inside a frame. The different shades of white paper and writing look so pretty together. I added wood trim above the bathtub tile, that I salvaged off of some old bed side rails. The wood was attached inside the side rails to hold the box springs. 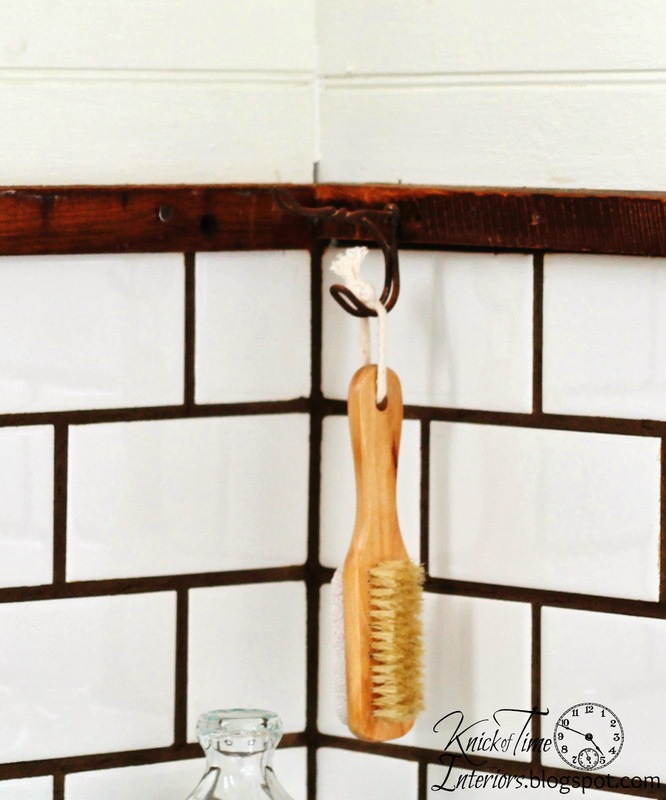 The wood was nicely aged and I hung an old coat hook on it to hold my nail brush. 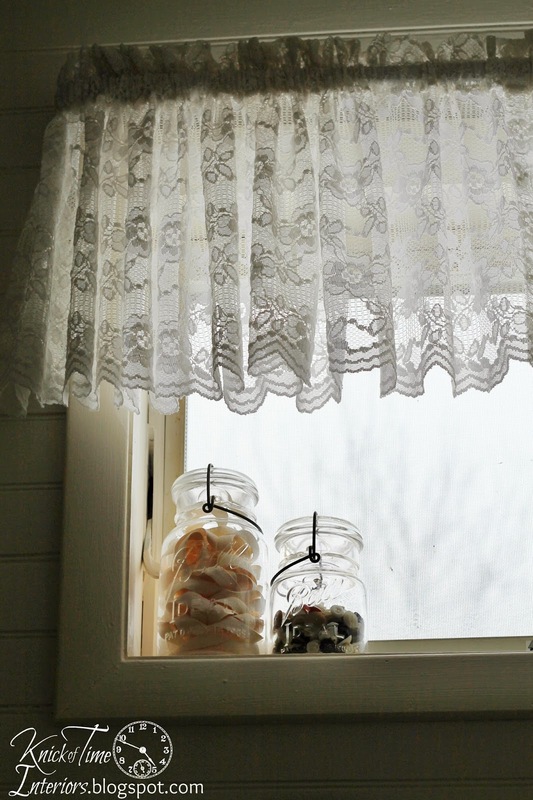 I bought a box full of lacy curtains for $1 at a yard sale in the summer, and found a valance to use for the window. I put some Mason jars in the window, and they are now holding my twill tape and some buttons that I frequently use when crafting. These two old mirrors were in the bathroom before, I just moved them over the toilet. This is kind of funny. I bought this rusty piece at an auction last year, and thought it was some kind of handle. I’ve tried to use it on several projects, and it never worked well for the projects. It occurred to me that it could work for a toilet paper holder, and it turns out – it IS a toilet paper holder, so I returned it to its original function! I just added an old board behind it to cover up the holes from the previous toilet paper holder. I hung some pretty, old plates in place of where the doilies previously were. 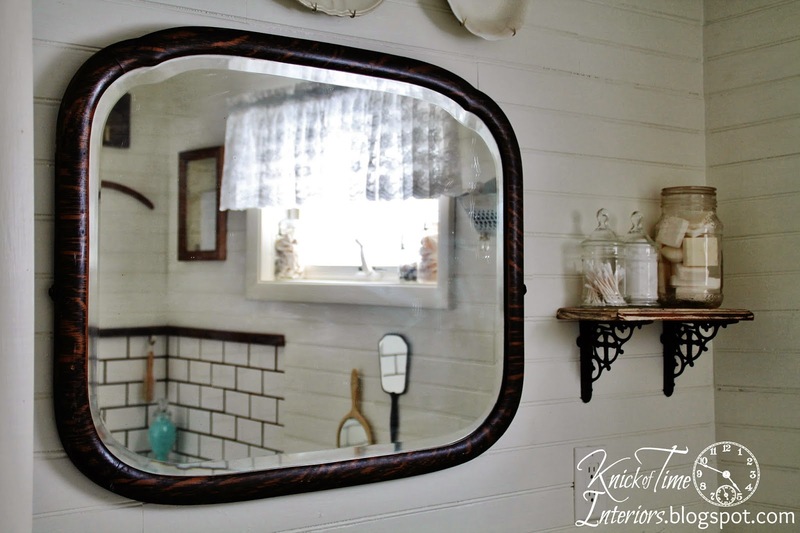 I also replaced the mirror above the sink with a larger mirror my husband and I found at an antique store when we went to Michigan last month. 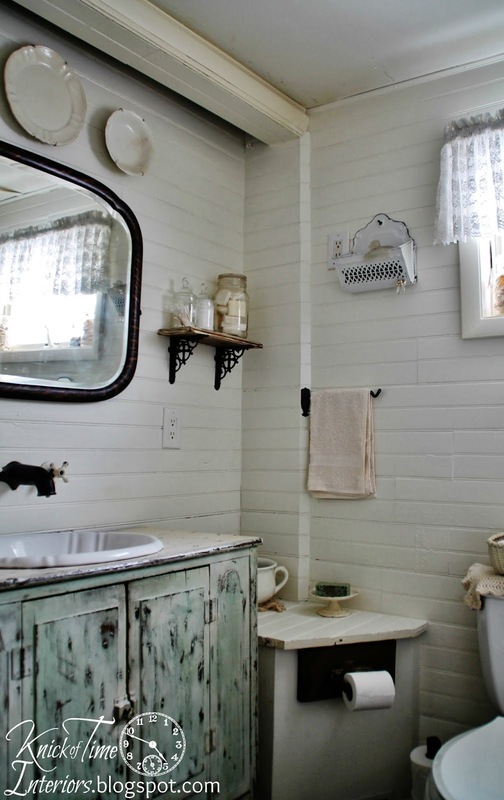 It has a classic farmhouse look that I really wanted to bring to my bathroom. 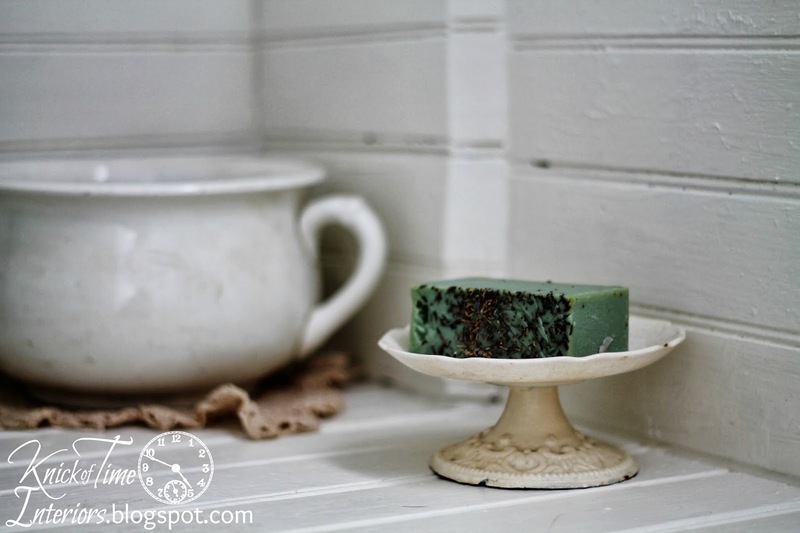 Soap from Sweet Harvest Farms adds a little pop of color sitting on an old plate, attached to a salvaged metal piece. I dismantled the previous towel holder/shelf, sanded back the paint, and added brackets for a pretty little wall shelf. 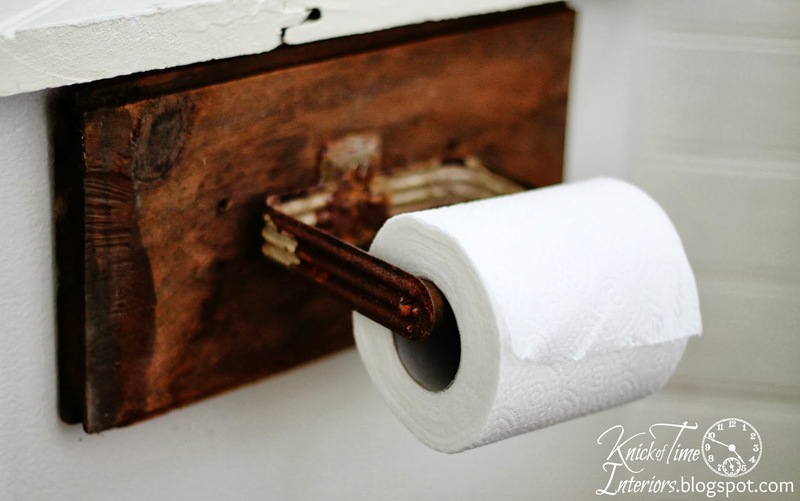 The previous toilet paper holder was returned to its intended function as the towel holder..
And and old cast iron cobbler’s shoe stand is used to hold a few rolls of toilet paper. About half of the people who took my Facebook poll, didn’t think I should paint the wood walls, and I understood why, but I truly love the room now. Turquoise is a beautiful color, but it was never my style. I feel like the new color and decor fits so much better with the rest of the house and I’m so glad I did it. If you’re a new visitor, you can see the first bathroom remodel project here. Yes, it looked like this when we bought our house! Click HERE to visit my Farmhouse Kitchen. 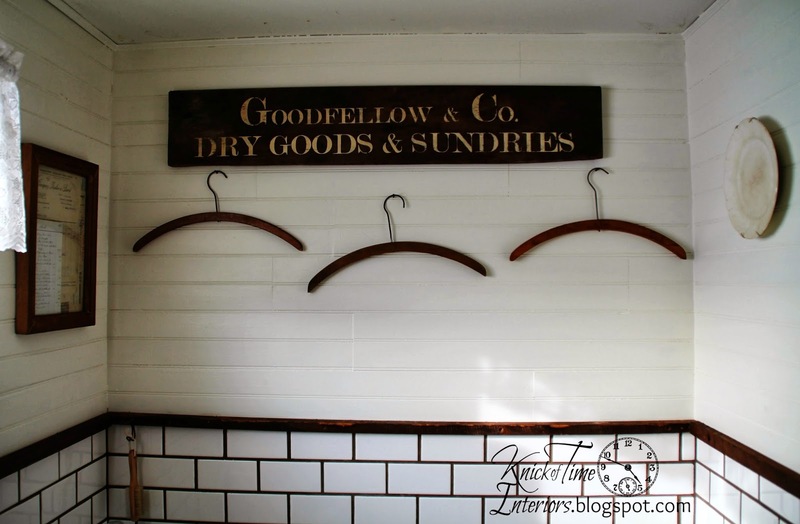 Click HERE to visit my Farmhouse Laundry Room. I love your bathroom! I did love the color too, but you can also ways paint again if you want. I love reading about all your talents! You know, as long as you love it, then that is all the counts since it’s your room, your house. I loved the before because I love contrast of color. The white really pops off the green. With that said, I also love the white on white, tone on tone look now. Goes to show you how easily I am swayed! Enjoyed the post, but slow down girl, you will wear yourself out. YES!! Love the softness and light feel of the room! It’s perfect! OH I think it turned out beautifully, Angie! Paint colors are so hard to choose, but this looks wonderful! Hi Angie, I had to laugh. It could have been me, who just wanted to wash some doilies and ended up painting and redecorating a whole room. I like turquoise too and when I see colorful rooms on blogs I really enjoy them. I could visit such rooms for some hours but then I’d need to go back to my neutral colored home. So I totally understand that you get along with the white much better. 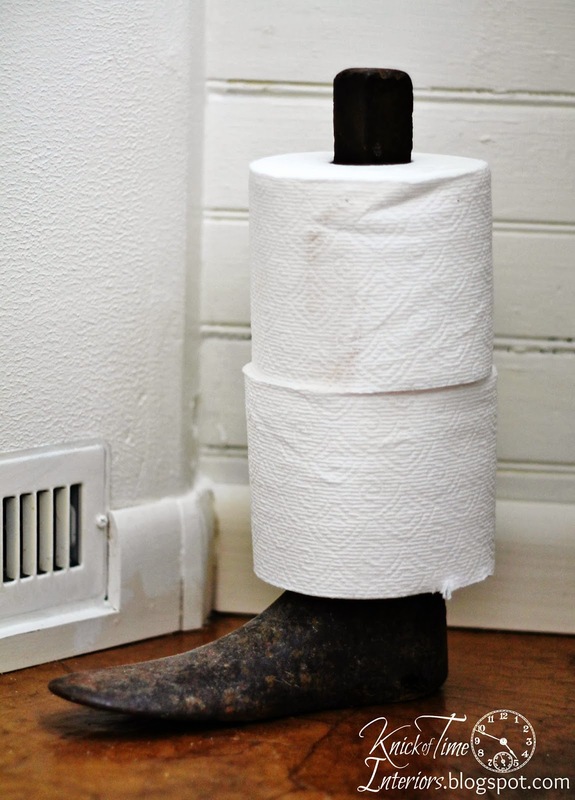 Your decorations are beautiful and the idea to use that shoe stand as a toilet paper holder is a super cool idea. Sorry for the other 50% but this is SO much better. It’s bright and instead of looking just “old” it looks time worn and warm. Love it. It’s simple, yet elegant, adorable and awesome! 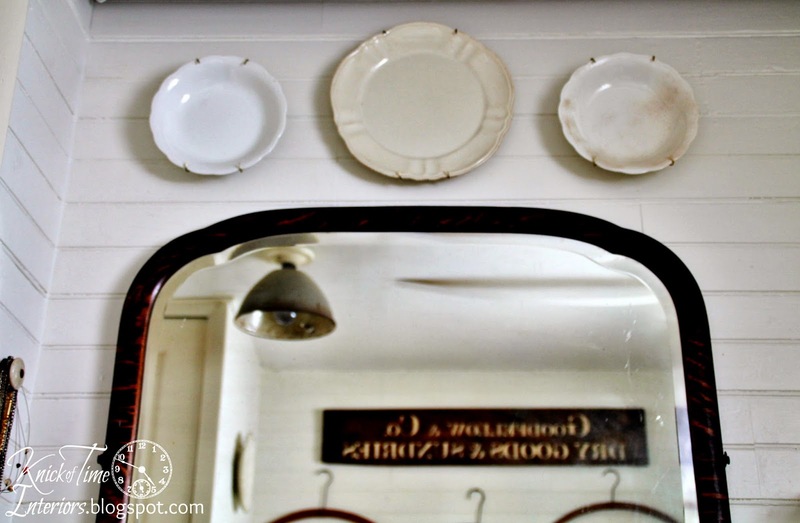 I don’t know how to say it, but those mirrors, those plates, they are all vintage! Exquisite! I love the paint job! So many cool accessories make it so interesting! The white is great and makes all your beautiful touches look even better! Beautiful. Love the color, accessories, sign and inspiration / love that you put into it. ( I can also relate to going from washing doilies to re-painting a room. Ooooh yes. ) Thanks for sharing. I enjoyed reading your post – your photos are lovely! Yup…. I like it better too. Love the sign as well, and giggled that this all started because the doilies needed to be washed and the sign was to replace them, but ended up in a different spot. That’s how it goes for me too, especially getting the paint right. Angie, it is so beautiful!! I love the sign and all the details. I really like the change Angie. The old color on the boards was wonderful, but a light color in a small room opens it up. Your changes in the accessories look great too. I especially like the shoe stand for extra toilet paper. Need to find me one of those. It looks wonderful Angie! I was one of the voters that liked the turqoise, but I love this new look. Great job! The new colors and decor are great! It’s nice to be able to pull from other rooms and the “stash” to complete the look you want. LOVE your toilet tissue holder! I lightened up my very small bathroom from a labor intensive faux finish that I loved but was just to overwhelming. WOW I always say what a difference a change in color makes. I really liked it before (and I’m a turquoise girl) but I love it now. Love your inspirations! You did a wonderful job. 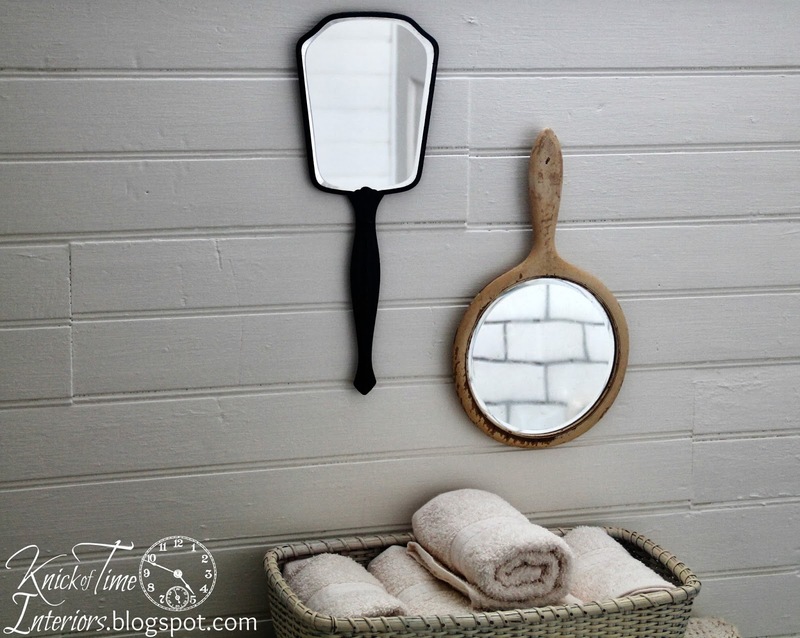 How did you hang your hand mirrors on the wall? I have some that were my Grandmothers and Mothers and would love to do something like that instead of having them propped against something where they always seem to slide or flop down. Love you new big mirror..yeh, I have a thing about mirrors…come to think of it, I have a ”thing” about a lot of things!! To thine own self be true! 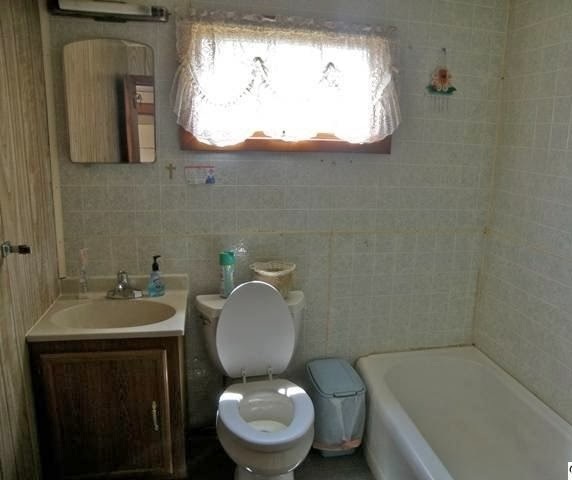 I love your new bathroom remodel, and as pretty as the turquoise was, this one is more YOU. LOVE your changes, Angie. what is the name of the color white you bought the second time? 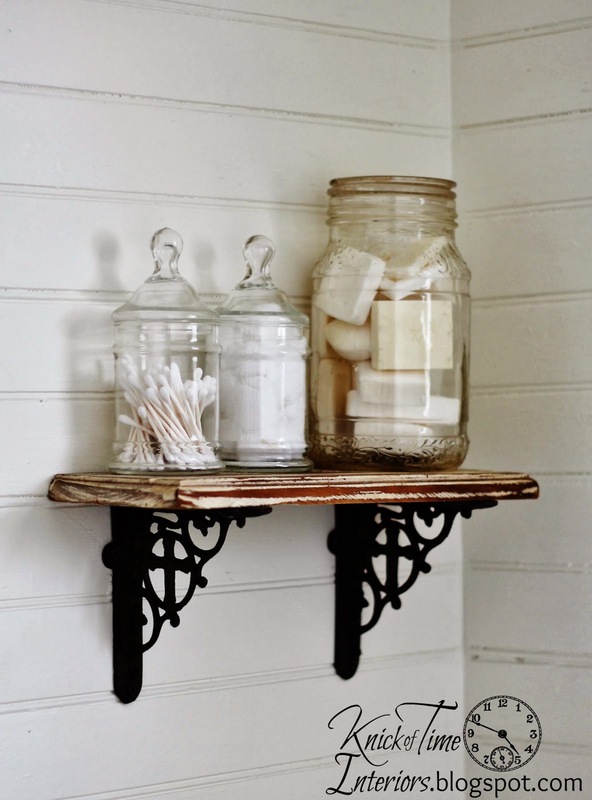 I am going to refresh my powder room as well and I would love to paint it the same white as yours. I am so glad I found your blog. I always enjoy my visit. That really was a gorgeous blue color – and it was cool that it was original paint…but if it’s not making you happy – then what’s the point!? It looks beautiful with the light, bright, makeover! Great job, Angie! Okay, I knew I should have proceeded with caution, WOW, I LOVE it, I think I pinned every picture, so clever and fresh and perfectly farmhouse! xo I want everything. wow, what a difference. I love how you used the old cobbler’s shoe. I love what you did in the bathroom, Angie. That shoe holder is genius! Angie, it is gorgeous!! 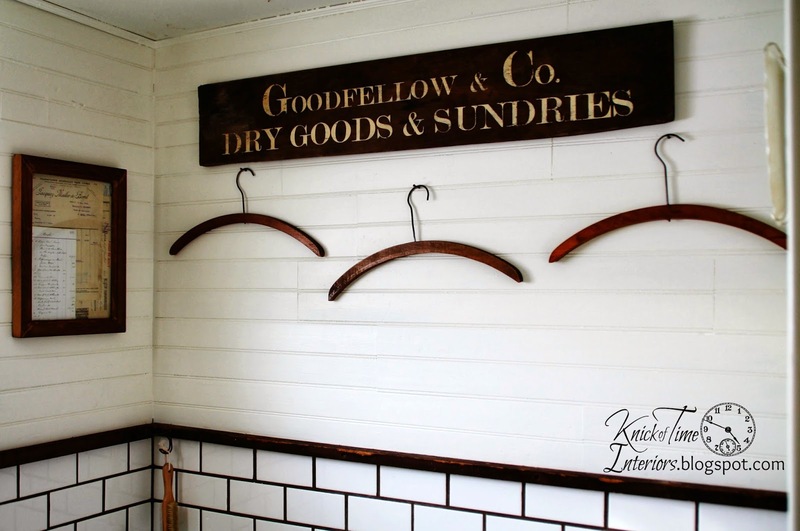 I’m in love with that sign and the hangers are the perfect touch with them! Love, love, love your style! Me again…here all this time I thought I was following your blog….I guess I see so many of your projects on Pinterest that I thought I was a follower! Anyway…..following now! 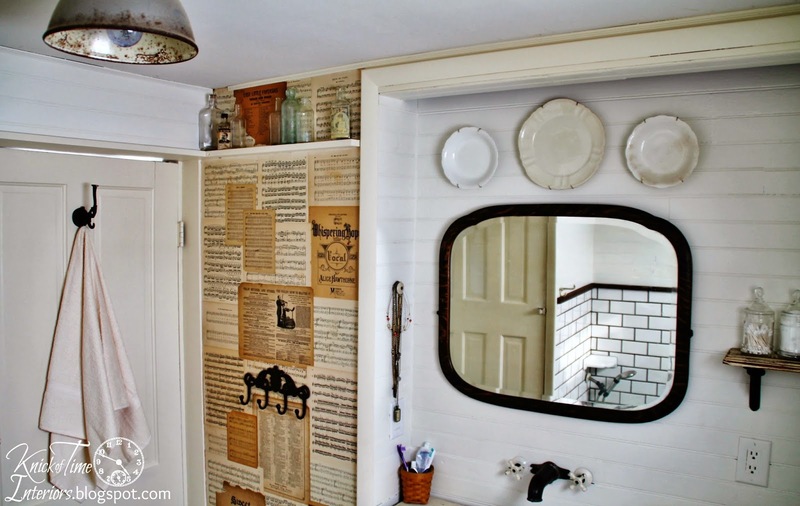 I’m trying to catch up on blogs, and I just had to stop by to say how fabulous your bathroom looks!! The white paint makes such a difference and fits so nicely with the rest of your home! Well done! 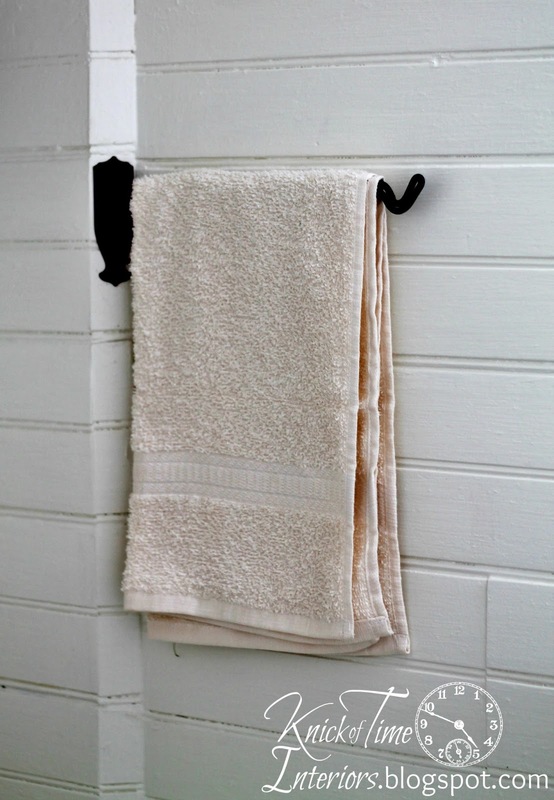 And I love all the vintage items you’ve used in unconventional ways. The bathroom may be changed again by now, but I think the new white look is better also. Funny though, I landed here from Pinterest on account of a bathtub like yours that you hate (I think yours is the old cast iron/porcelain?). Several years ago we bought our 1930’s farmhouse and stupidly starting “updating” it. I threw out one of my old cast iron bathtubs (luckily I hadn’t gotten around to the other one yet, before I wised up!). I’ve been on Craigslist today looking for a bathtub just like that to put back in here. Luckily, apparently a lot of people don’t like them and I can get another for about $50.00. Then a couple hundred to re-glaze and I’ll have a new, old bathtub for less than half (in some cases, a quarter of the price) of a new, modern one, which – I learned the hard way – I don’t even like. love what you do…..Had a difficult time going to bed…my mind was in high gear!! Your bathroom is gorgeous. I think I like that color better it brightens up the room. Love how everything’s rustic. And Love your toilet paper holder. Lol. Beautiful job, I love it!. My only question: Why do you hate your tub (assuming it’s the same one that is in the “before” pic)? My parents had the same style tub from a 50’s era remodel of their 100+ year old farm house. They got rid of it and I wish I had it! It was big and deep. Reglaze that puppy and soak on! Hello Angie ! 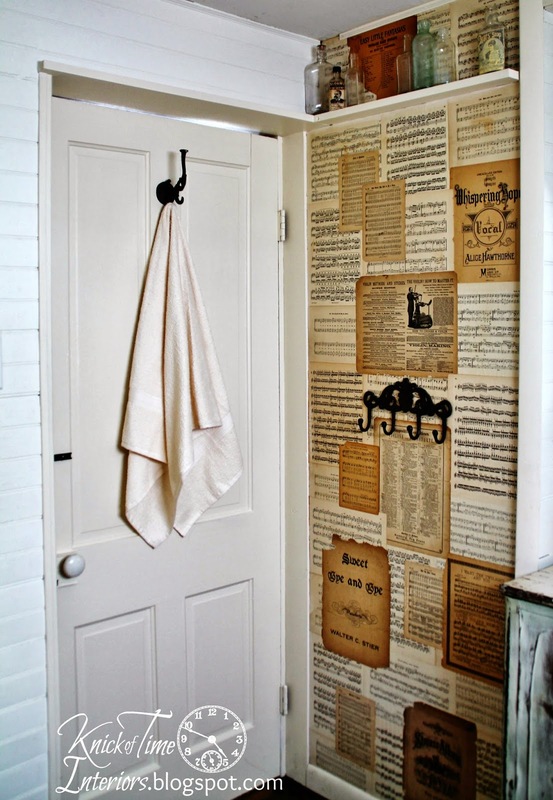 Love what you did with your bathroom. You’re really talented ! Nice pictures and comments. So interesting to read. Thank you for taking ideas I just inherened a home that was a mess I have to redo everything. I love this bathroom. So many people like white or off white walls..Im really a fan of color. I was considering painting my living room walls a medium green. I have alot of windows and white woodwork, so I don’t think it would be too dark. I know its just paint, but it would be a big job. Now I wonder why so many people like all that white? Hi Angie, love your blog, I look forward to seing your new posts. I have a question, the Goodfellow sign, what did you use for the letters? Hi Cheryl, I designed a stencil to make that sign.